Dogs are often considered man’s best friend. While many people may teach their best friends simple tricks, not all of them go the extra mile and do advanced training. 4-H is a nationwide organization focused on service for children of all ages. The four H’s stand for “Head, Heart, Hands, and Health.” 4-H has a variety of subjects such as sewing, raising show chickens and horseback riding. 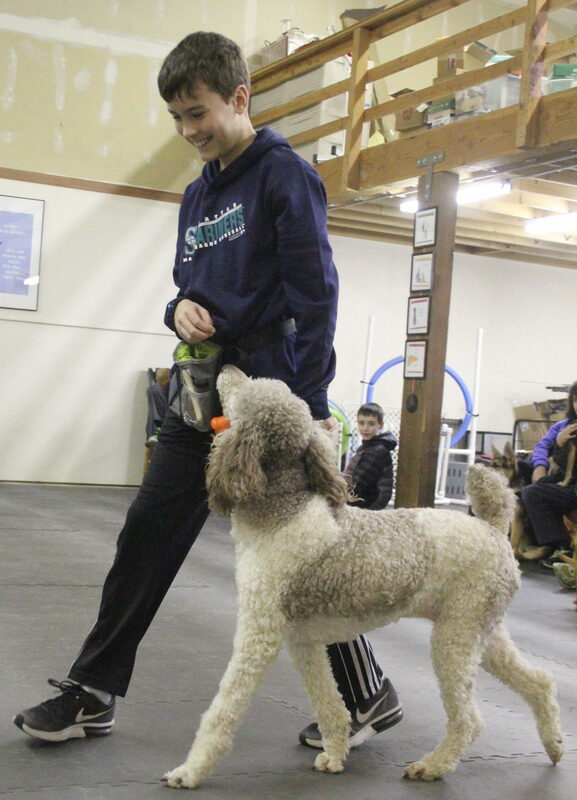 Erin Gayton of Olympia leads a 4-H dog training group called “Helping Hounds.” There are several 4-H dog clubs in Thurston County, but Helping Hounds has a special emphasis on inclusion. Helping Hounds consists of 20 members, elementary through high school, of all abilities. The group meets twice per month and also participates in service projects, community building activities and competition events. Each 4-H club decides how often to meet and what their focus is. Erin Gayton, leader and founder of Helping Hounds since 2014, says “My son, Nate, has autism and at the time [of the club starting] we were taking service dog classes.” The 4-H Dog Project also has specific programs for service dogs. “Although a few dogs in the club were service dogs, at least in the beginning, that was never the purpose of the club. Our goal was to create a truly inclusive social opportunity for kids of all abilities,” Gayton says. Gayton learned that parenting an autistic child often requires unique or increased involvement in activities. “Many programs are willing to accept special needs kids, but they don’t have the knowledge or staff to truly support the child and make it a rewarding experience. What that means for families is that you don’t get to drop off your kid for swim lessons and go read a book – you have to be right there, in the pool, supporting him and advocating for him,” she says. 4-H is not the first extracurricular Erin has participated in with Nate. “When he did Cub Scouts, I was a Cub Scout leader. When he took Tai Kwon Do, I took it, too,” she explains. Helping Hound’s “commitment to kindness,” as Gayton puts it, makes it a fun experience for all members. Both of Gayton’s sons are members of Helping Hounds. Her oldest, Finn, is the President of the club and trains his chihuahua mix, Patrick. “He [Patrick, the dog] is smart and a quick learner,” Finn says. He has participated in 4-H since Helping Hounds began and he has “learned a lot about dog handling” since the club’s founding. Gayton’s younger son, Nate, trains his service dog, Jax, during their meetings. The group works to include everyone, regardless of any obstacles they may face. 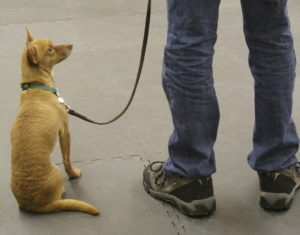 One member of the club doesn’t currently own a dog, but can still participate, using the Gaytons’ third dog, Chudley. This is a typical club, with members holding official positions, like President and Treasurer. Kyle A., a sixth grader at Washington Middle School, is the Helping Hounds treasurer. This is his third year in 4-H and he says that the most important thing he has learned from this club is how to “not get frustrated at things I can’t control. I used to get mad at my dog [Pearl, a standard poodle], which caused her to not pay attention. You have to learn to respect if they aren’t paying attention. The only thing that will help is not getting frustrated,” he shares. 4-H clubs are a great way for kids of all ages to learn vital skills for the rest of their lives, like perseverance, patience and service to the community. 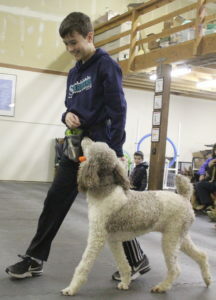 In addition to learning about dog training, the 4-H Dog Project is an opportunity for animal education. Gayton’s youngest son, Nate, is Helping Hounds’s “Dog Knowledge Captain.” He selects a breeding group (ex: toy, herding, or sporting dogs) for the club members to research monthly. 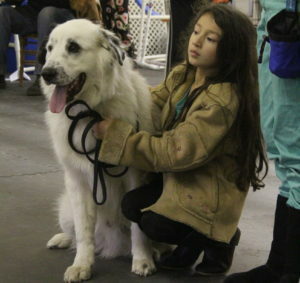 Each person researches and brings back information about a breed in the chosen category. During a meeting, Nate presents a poster, complete with trivia, to the group. 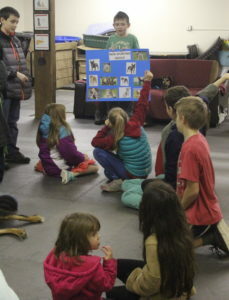 Getting to learn about dogs is a great way for kids in Helping Hounds to hone independent research skills. As well as competing in several fairs, including the Southwest Washington, Thurston County and Washington State fairs, Helping Hounds members also complete service projects for their community. Service is a big part of all 4-H clubs and Gayton stresses this with her group as well. “What I appreciate most about 4-H is the way it balances passion for a subject with social responsibility. In the Dog Project, we learn to care for, train and handle our dogs, but that is only part of what it means to be in 4-H. Serving the community and serving each other (as mentors and leaders) is equally important,” she shares. 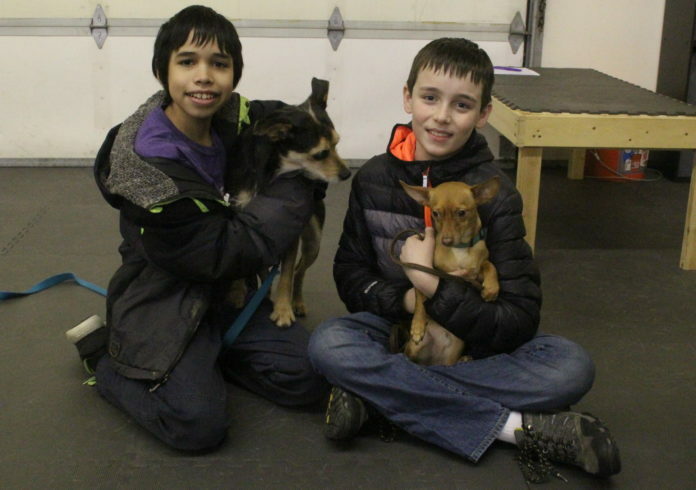 Helping Hounds is the newest Thurston County 4-H club and other Dog Project participants were willing to help get the club off on the right foot. Each member’s willingness to mentor and support the newest recruits sets Helping Hounds up to have a “reputation for acceptance and kindness,” as Gayton puts it. One of the training and service opportunities that Helping Hounds does each year is visit the Hands On Children’s Museum (HOCM). On Saturday, January 13, various Helping Hounds members and their dogs took shifts at the Outdoor Discovery Center at the HOCM. In the two hours, 200 people visited the attraction, providing the members with an opportunity to talk about their club and to work on their dog’s social interaction skills. Public events such as visits to the HOCM provide a way for the community to experience dogs in a safe, educational and positive way. Responsibility, patience, kindness and acceptance lay the foundation for great leadership. 4-H and its clubs across the nation provide kids of all ages an opportunity to learn these traits, setting our youth up for a bright future. For more information about Thurston County 4-H or Helping Hounds, please visit them online or email helpinghounds@thurstoncounty4hdogproject.com.